Here he is. He doesn't have a name yet, but he is loved already. Today, he met his aunt, Shine, nobody restrained, which we were told went really well. Poor Chendra was outside all alone and was a little beside herself. We went to the zoo today with the Throop fam. It was a lot of fun going with them. We also saw the polar bear, penguins, primates, warty pigs and just a few others. Not a long trip today. Nap time encroached early! 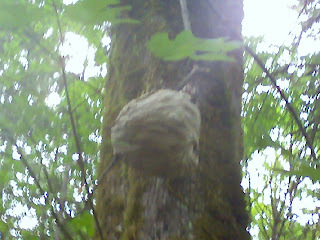 In other news, along my daily walk the other day, I stopped to photograph the ginormous bee hive and here it is. Just for reference, it is about the same size as a large cantaloupe or small watermelon. Let's just say it's big enough to make us all walk quickly past it. Yay! Pictures. 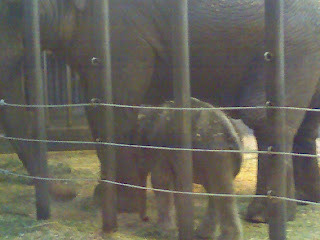 Did you see the picture of the baby elephant on my blog? I love the zoo this time of year. Get there when it first opens and it is wonderful. Isn't it frustrating when people don't log out of their gmail and other people end up commenting as them?! I commented as Cameron yesterday and Courtney today. How can I get these kids trained? Good thing I didn't say anything major embarrassing. It is my blog that you should see the picture of the elephant on. Hey Robin. If you want a background similar to mine you can find them at http://www.thecutestblogontheblock.com/ it is so easy and so much more fun than the traditional blogger layouts. Fist you change our layout on blogger and pick the new template called "Minima". Then you copy the computer lingo from their website and paste it into a new blogger element. You can always call me if you have questions. Have fuN!